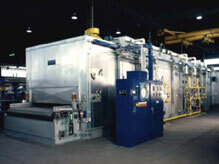 Inside Bake Ovens (IBO) are used in the beverage container industry. Aluminum cans are coated inside for saniation purposes and to prevent aluminum taste in the beverage. Typically the cans are spray coated and transferred to a flat belt conveyor. This conveyor transfers the cans to the belt going through the oven. Belt speeds are designed to allow the cans to pack together to get a tight load all the way through the oven. Beverage cans come in a variety of sizes. Some are very tall and narrow and some are short and wide, and all combinations in between. The IBO must be designed to handle the variety of shapes as well as the variety of coatings used inside the can. A very precisely engineered air delivery system is used to apply heated process air to the can pack as it goes through the oven. The air must be sufficient enough to plunge into the can and reach the depth of the coating and yet be gentle enough to not tiip the very light aluminum can. Oven balance is very critical for uniformity of drying and curing all of the cans equally. Exhaust fan volumes and locations of pick up points are consistent with maintaining the delicate balance of the oven chambers. Another design consideration is the “real world” condition of handling a less than full load of cans without blowing them all over the inside of the oven. This condition can only be met with the experience of air flow characteristics obtained form the industry. IBO’s are designed with adjustable air ducts to be lowered or raised per the can height. They usually have more than one zone of heat and a cooler section. The heat zones can be set to temperatures that are optimum for a coatings particular dry and cure cycle. The cooler brings the can back to a reasonable temperature for processing in the next stage of production. To insure the operation of Inside Bake Ovens meet the stringent criteria described above, FECO factory test each oven prior to shipping. All settings are marked and recorded for ease of installation and start up in the field.